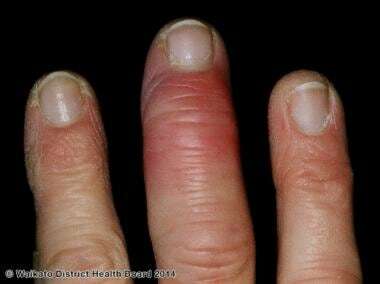 Erysipeloid is an occupational disease. [2, 3] Humans acquire erysipeloid after direct contact with infected animals. Erysipeloid is more common among farmers, butchers, cooks, homemakers, and anglers. The infection is more likely to occur during the summer or early fall. See the image below. Erysipeloid. Courtesy of DermNet New Zealand (http://www.dermnetnz.org/topics/erysipeloid/) and the Waikato District Health Board (http://www.waikatodhb.health.nz/). Meanwhile, the host's immune system is activated to start fighting against this foreign bacterium. The organism may escape immune surveillance and may spread in the body via the vascular system to the joints, heart, brain, CNS, and lungs. The organ most commonly affected other than the skin is the heart. Infection with E rhusiopathiae occurs in worldwide distribution in a variety of animals, especially hogs. No racial predilection is recognized for erysipeloid. Both sexes may be equally affected; however, erysipeloid seems to affect more males than females because of occupational exposure. Erysipeloid can affect any age group. Erysipeloid usually is an acute, self-limited infection of the skin that resolves without consequences. Cutaneous forms of erysipeloid usually are self-limited even without treatment; therefore, skin-limited erysipeloid has a fairly good prognosis with no long-term sequelae. Individuals with the systemic form of erysipeloid, in which organs other than the skin are involved, may have neurologic, cardiologic, or other impairments. Individuals with systemic infection may even die of sepsis, if the proper diagnosis is not made and treatment is not initiated early on. Prognosis of the systemic form of erysipeloid depends on the organ systems involved and on the extent of involvement. Early recognition and proper initiation of therapy is crucial to prevent sequelae. Instruct patients to be cautious while handling animals and animal products. Wang Q, Chang BJ, Riley TV. Erysipelothrix rhusiopathiae. Vet Microbiol. 2009 Aug 8. [Medline]. Brooke CJ, Riley TV. Erysipelothrix rhusiopathiae: bacteriology, epidemiology and clinical manifestations of an occupational pathogen. J Med Microbiol. 1999 Sep. 48(9):789-99. [Medline]. Reboli AC, Farrar WE. Erysipelothrix rhusiopathiae: an occupational pathogen. Clin Microbiol Rev. 1989 Oct. 2(4):354-9. [Medline]. [Full Text]. Shimoji Y, Ogawa Y, Osaki M, et al. Adhesive surface proteins of Erysipelothrix rhusiopathiae bind to polystyrene, fibronectin, and type I and IV collagens. J Bacteriol. 2003 May. 185(9):2739-48. [Medline]. Wang Q, Chang BJ, Mee BJ, Riley TV. Neuraminidase production by Erysipelothrix rhusiopathiae. Vet Microbiol. 2005 May 20. 107(3-4):265-72. [Medline]. Boyd AS, Ritchie C, Fenton JS. Cutaneous Erysipelothrix rhusiopathiae (erysipeloid) infection in an immunocompromised child. Pediatr Dermatol. 2014 Mar-Apr. 31 (2):232-5. [Medline]. Veraldi S, Girgenti V, Dassoni F, Gianotti R. Erysipeloid: a review. Clin Exp Dermatol. 2009 Dec. 34 (8):859-62. [Medline]. Principe L, Bracco S, Mauri C, Tonolo S, Pini B, Luzzaro F. Erysipelothrix Rhusiopathiae Bacteremia without Endocarditis: Rapid Identification from Positive Blood Culture by MALDI-TOF Mass Spectrometry. A Case Report and Literature Review. Infect Dis Rep. 2016 Mar 21. 8 (1):6368. [Medline]. Wang Q, Chang BJ, Riley TV. Erysipelothrix rhusiopathiae. Vet Microbiol. 2010 Jan 27. 140(3-4):405-17. [Medline]. Tomaszuk-Kazberuk A, Kaminska M, Sobkowicz B, Hirnle T, Prokop J, Lewczuk A, et al. Infective endocarditis caused by Erysipelothrix rhusiopathiae involving three native valves. Kardiol Pol. 2011. 69(8):827-9. [Medline]. Veraldi S, Girgenti V, Dassoni F, Gianotti R. Erysipeloid: a review. Clin Exp Dermatol. 2009 Dec. 34(8):859-62. [Medline]. Shin SJ, Gwak WG. Erysipelothrix rhusiopathiae peritonitis in a patient undergoing continuous ambulatory peritoneal dialysis. J Korean Med Sci. 2010 Aug. 25 (8):1234-6. [Medline]. Fidalgo SG, Longbottom CJ, Rjley TV. Susceptibility of Erysipelothrix rhusiopathiae to antimicrobial agents and home disinfectants. Pathology. 2002 Oct. 34(5):462-5. [Medline].